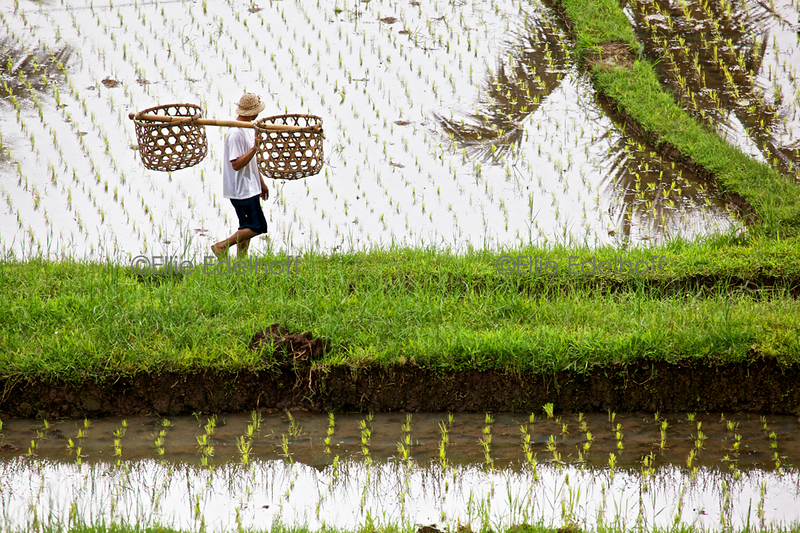 Shouldering a sturdy pair of bamboo baskets, a man walks through the dykes between rice paddy fields at Jatiluwih, Bali’s most famed rice terraces. 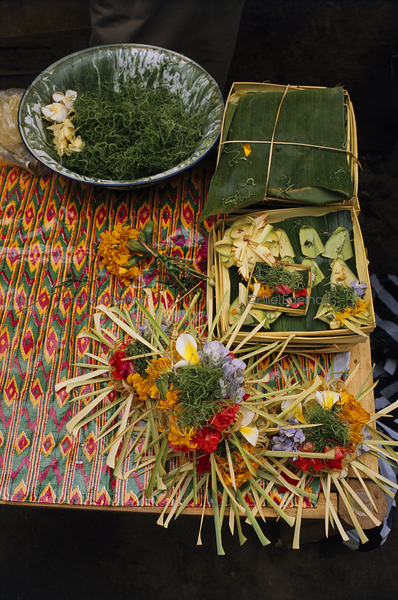 Its indescribable shades of green, centuries-old terraces meticulously maintained, and vistas of heaven- on- earth, Jatiluwah, meaning ‘truly marvelous’ is just that. 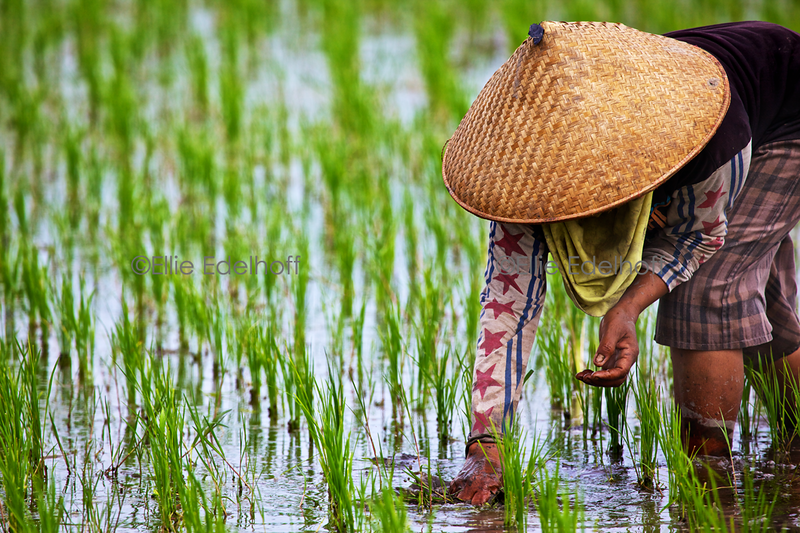 A woman works her rice paddy adorned in stars and stripes. 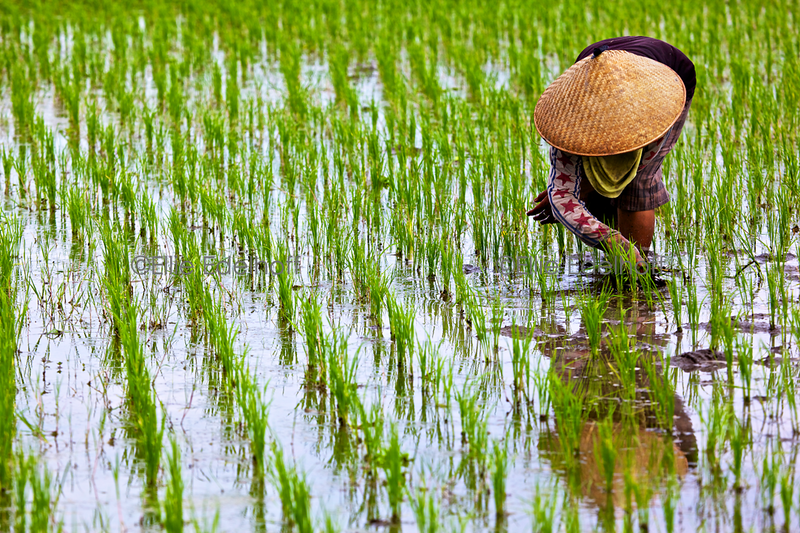 A rice field worker is reflected in the waters of the paddy field. 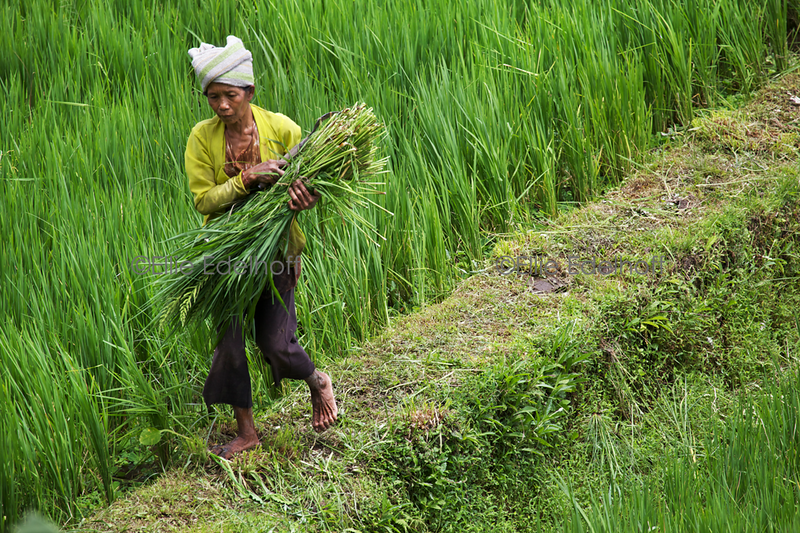 On a narrow dyke, a Balinese woman carries a bundle of rice. 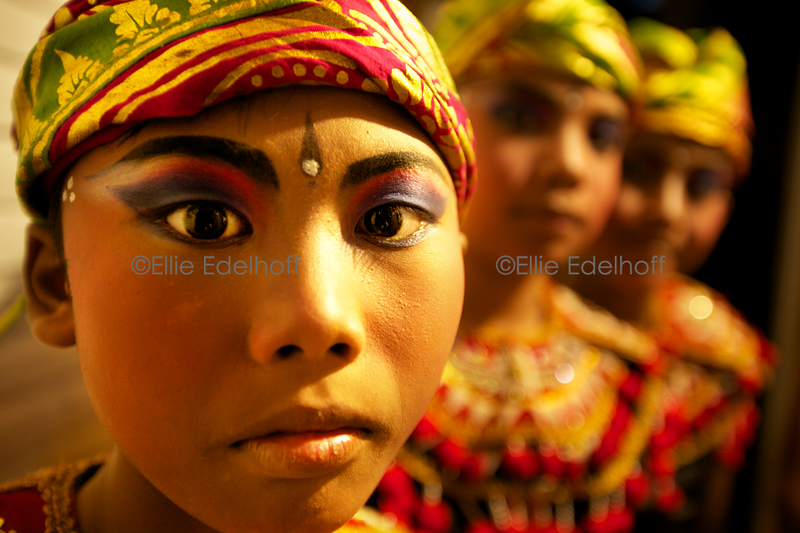 Adorned in traditional Balinese dance costumes, boys stand ready to perform a warrior dance. 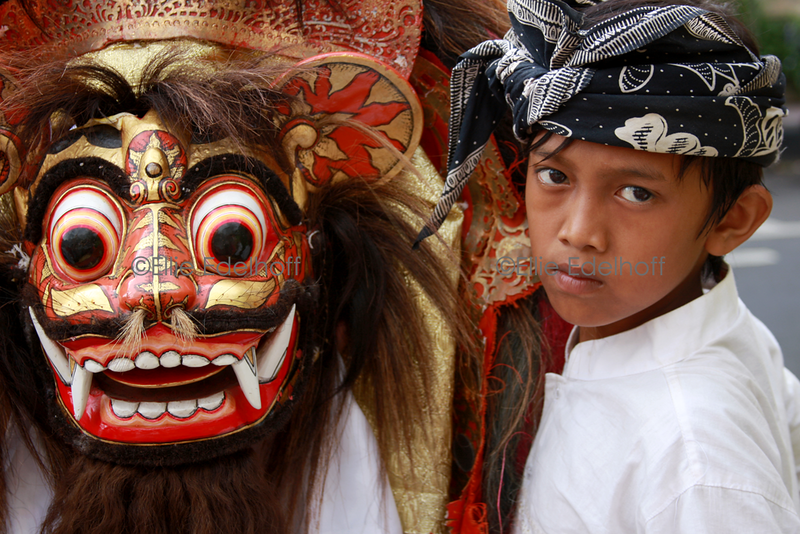 Awaiting their dance performance, Balinese boys playfully practice their wayang puppet-like moves. 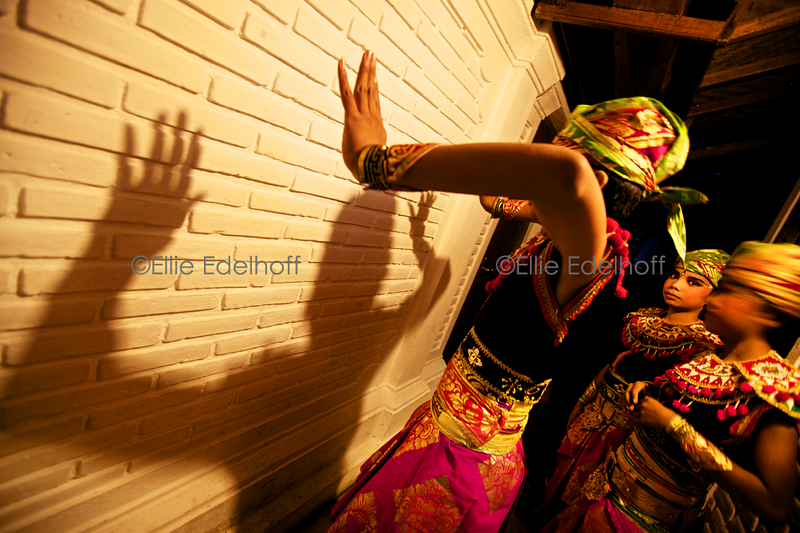 With a generous touch of lipstick, Balinese girls ready themselves to dance and transform themselves to deities. 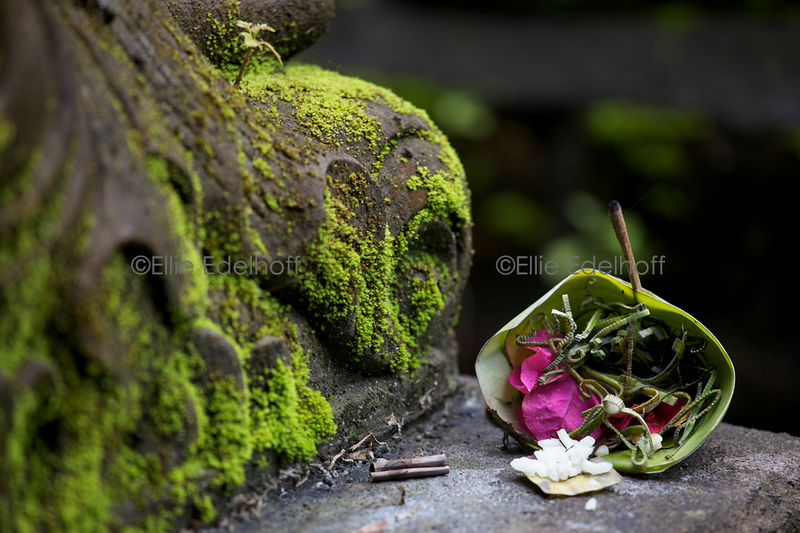 Sculpted from volcanic black andesite, a loyal stone guardian stands watch at an Ubud temple entrance, protecting it from evil spirits. 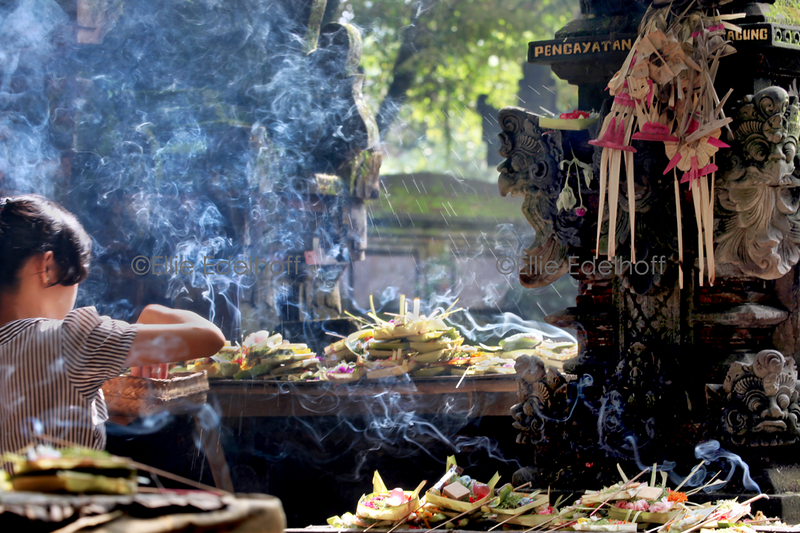 Incense and offering flowers aid the sentry’s task, summoning benevolent spirits. 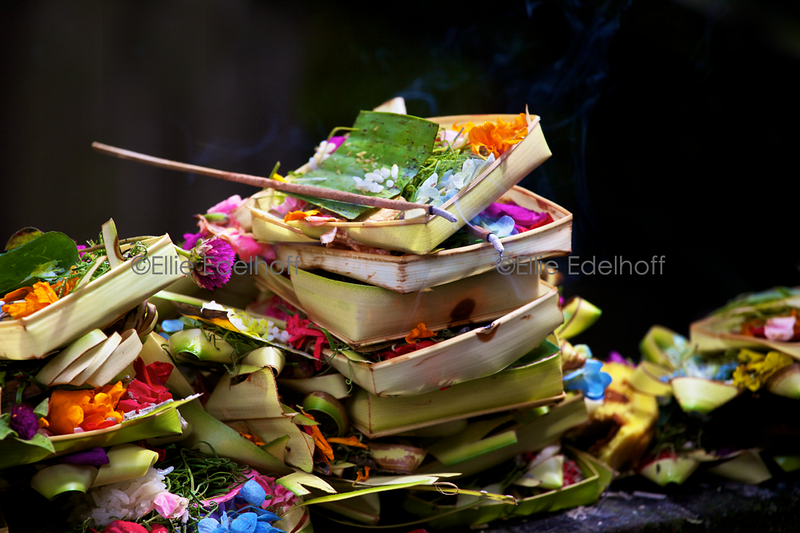 With a sweetly fragrant campaka flower commonly used for temple worship, a woman invokes the Ubud market temple’s resident deity. 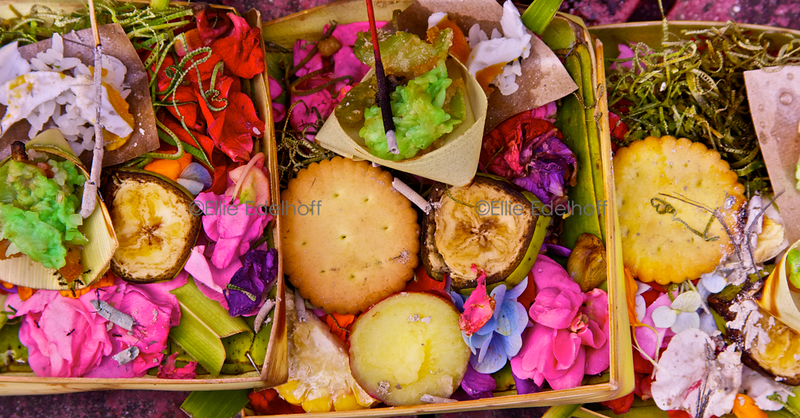 The temple walls are stacked with ‘canang’, traditional coconut leaf trays filled with offering flowers, an essential elements of Balinese worship. 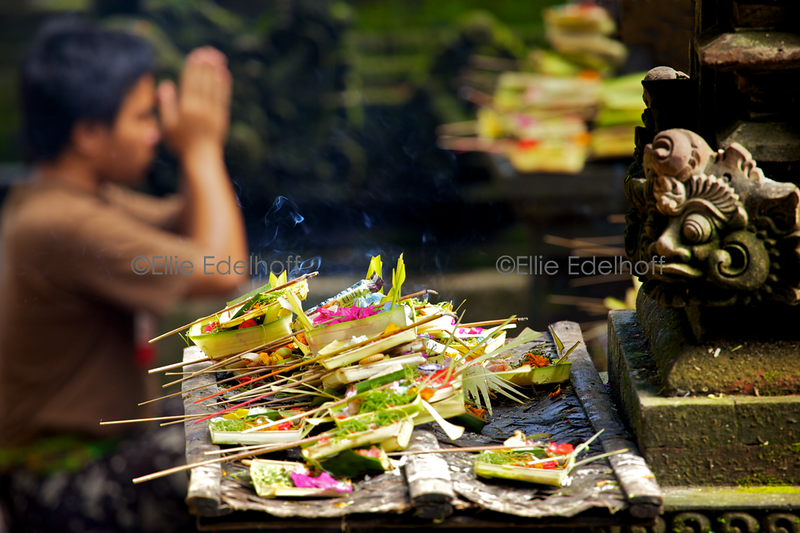 Smoking incense sticks send curls of prayers heavenward from palm leaf offering trays. 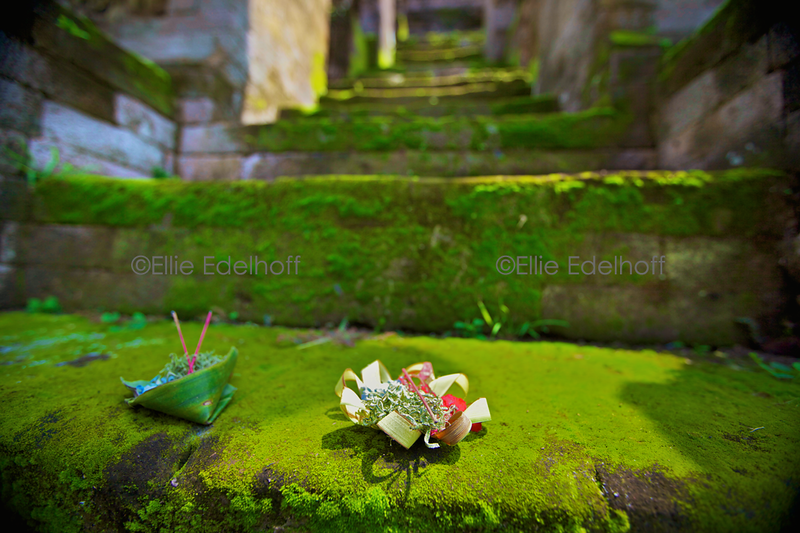 Like a stairway to heaven, incense carries prayers to the divine and carries back their blessings. 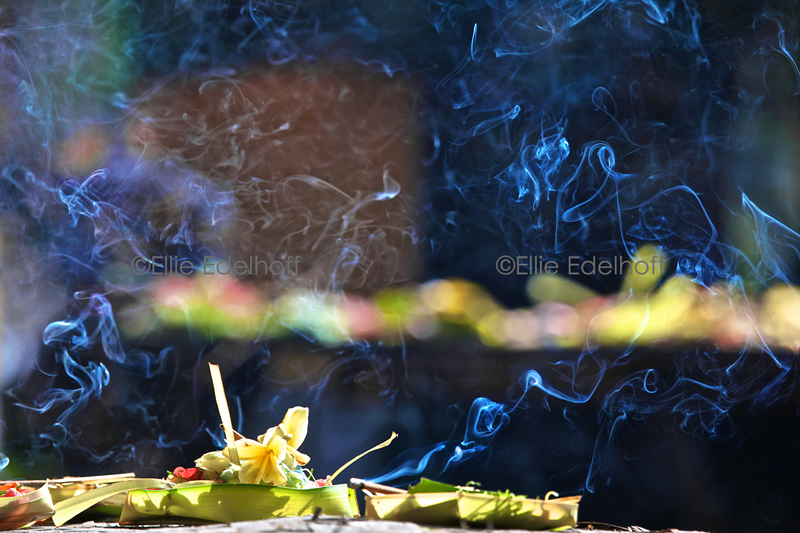 In early morning light, a young man prays at an Ubud temple complex already filled with the heady scent of flower offerings and incense. 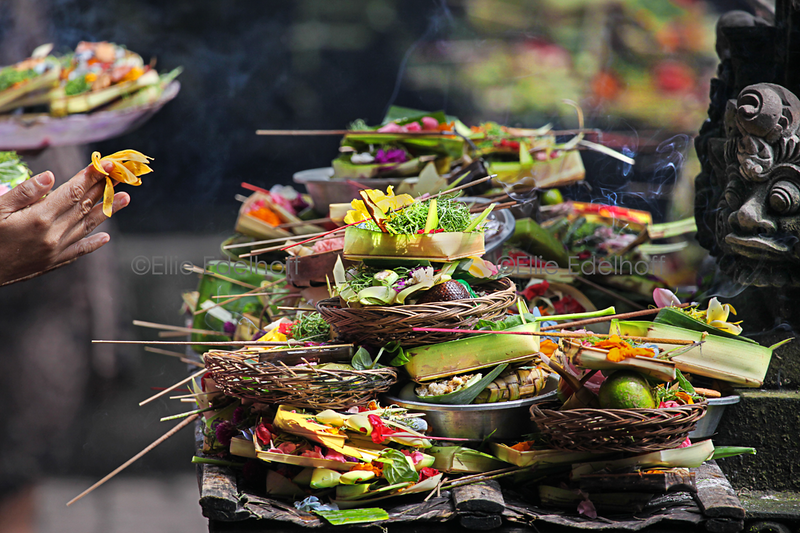 Colorful stacks of Balinese offering trays line an Ubud temple wall to appease malevolent spirits and to attract benevolent ones. 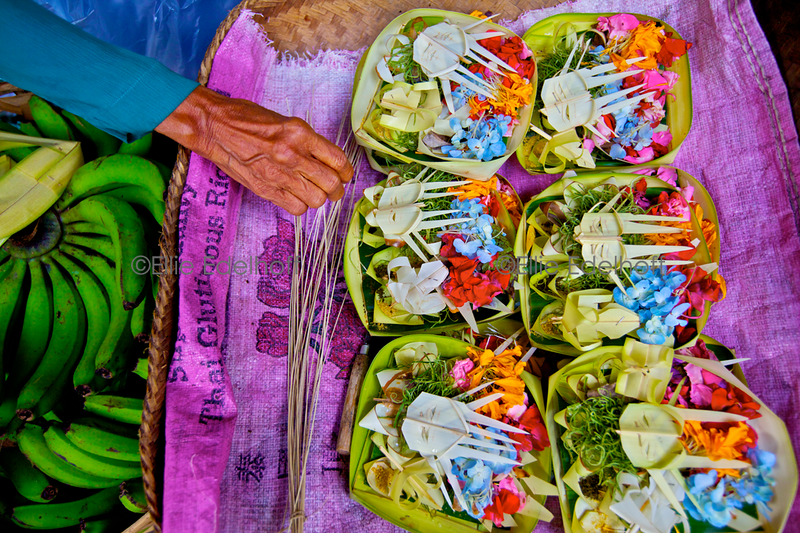 A woman sells ‘canang’, traditional offering trays at Ubud’s bustling market. 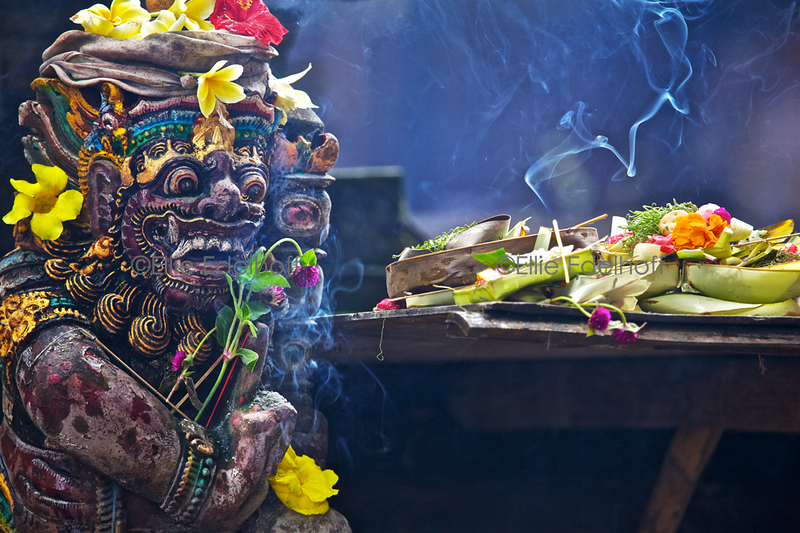 Artistically prepared with spiritual significance beyond beauty, their purity, softness, and fragrance attracts benevolent spirits and appeases malevolent ones.